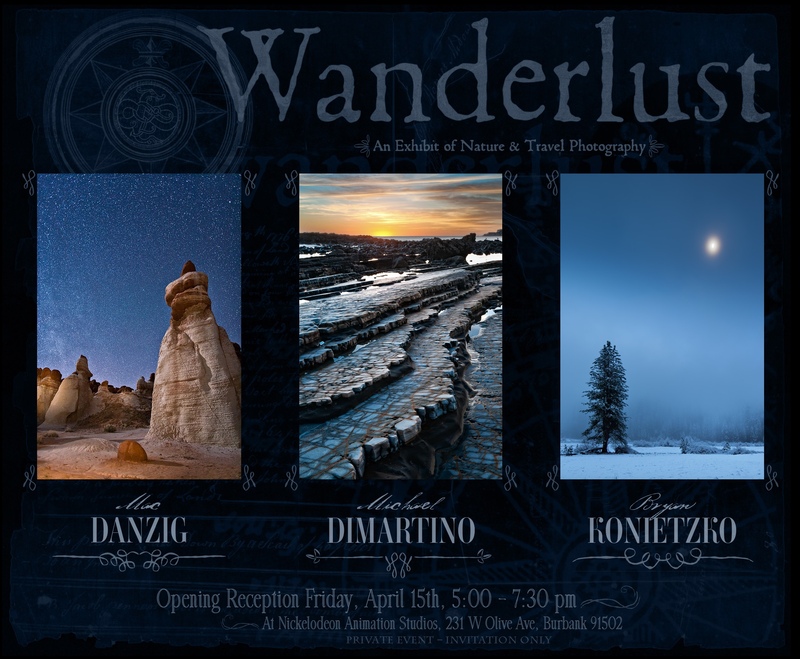 I’m happy to announce that on Friday, April 15th, photographers Bryan Konietzko, Michael Dimartino and myself will have a gallery opening at Nickelodeon Animation Studios in Burbank, California. The word “Wanderlust” defined is A German word for the irresistibly strong desire to travel. This sums up the subject matter that we will be displaying. Everything from cityscapes, to wildlife, to extremely remote landscapes will be shown by all three of us. Although the reception is technically a “private event” I invite any of my blog readers in the area to stop by and say hi. Admission is free. Also, our art will be up for approximately 1 month here, so if you aren’t able to make the opening, there will be plenty of time to check out the gallery afterward. I will be selling signed canvas-mounted prints of rather random subjects (though mostly natural landscapes and wildlife). Limited edition signed prints will also be available. 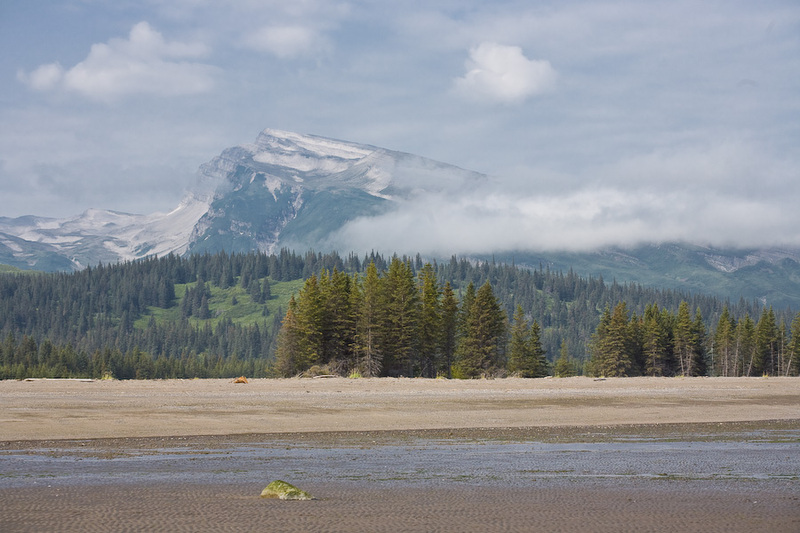 Silver Salmon Creek Lodge, Lake Clark National Park, Alaska: A photography trip report. 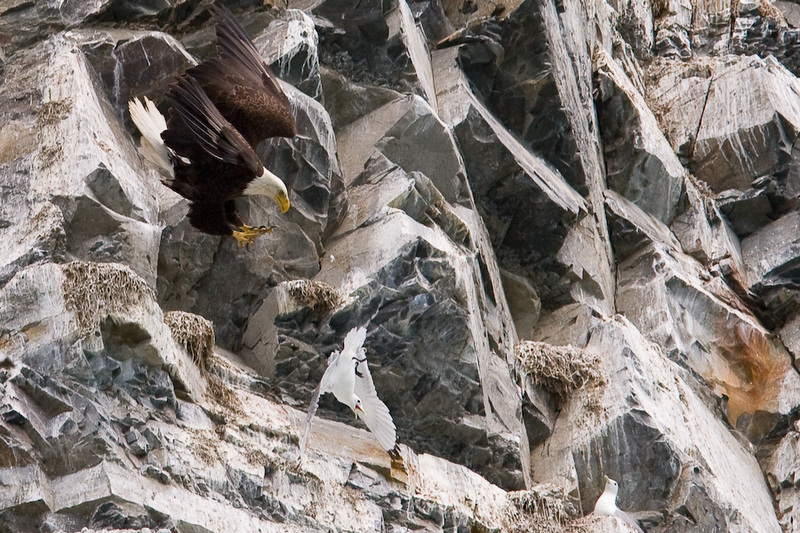 In July of 2009, I traveled to Alaska for an unforgettable photography excursion. 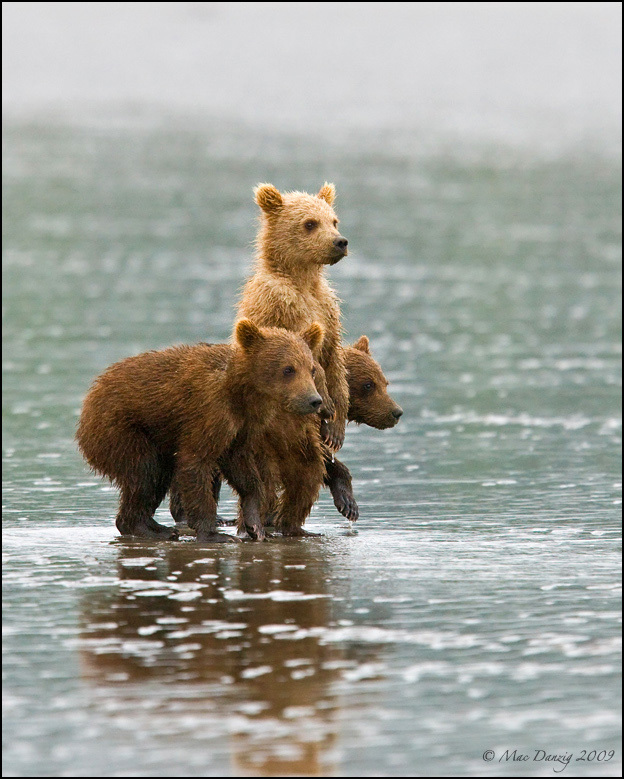 Wildlife photography has been a branch of the art that always kept itself just past arm’s-reach. 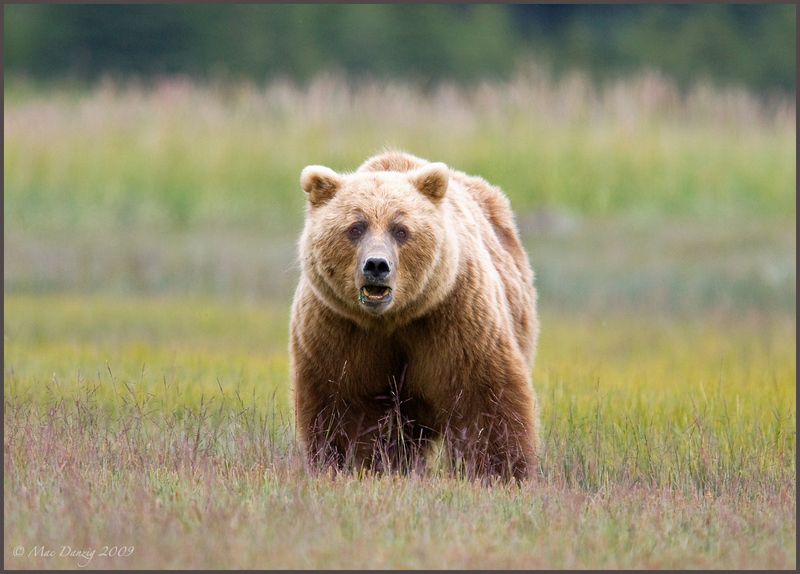 It is designated to those photographers who have time, patience, money, and the ability to venture into areas where truly elusive wild animals can be seen. 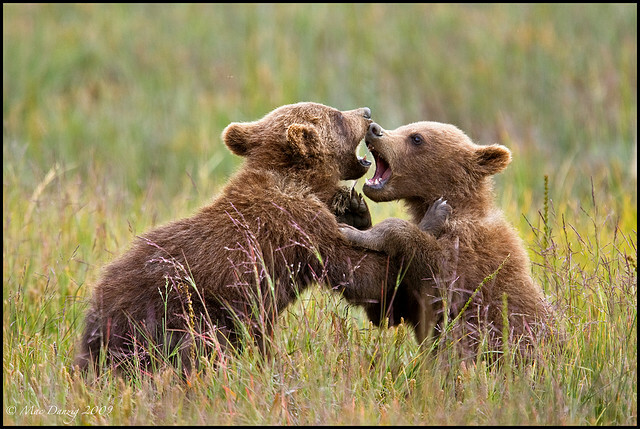 After an excellent trip to Yellowstone National Park in 2008, I was left with the urge to capture more true wildlife photos. Grizzly Bears were one of the few indigenous species of wildlife in Yellowstone that I never got a glimpse of during my short 1-week stay, and although the trip was a huge success in many ways, I became increasingly jealous of some of my friends on Naturescapes.net and their amazing Brown Bear photos… A trip was in order. I researched the possibilities thoroughly, and with the help of other NSN members, including Bill Lockhart, I finally made the decision to book a trip to Silver Salmon Creek Lodge in Lake Clark National Park, Alaska. Phil Colla had published a detailed travel report from the lodge, as had Bill Lockhart. 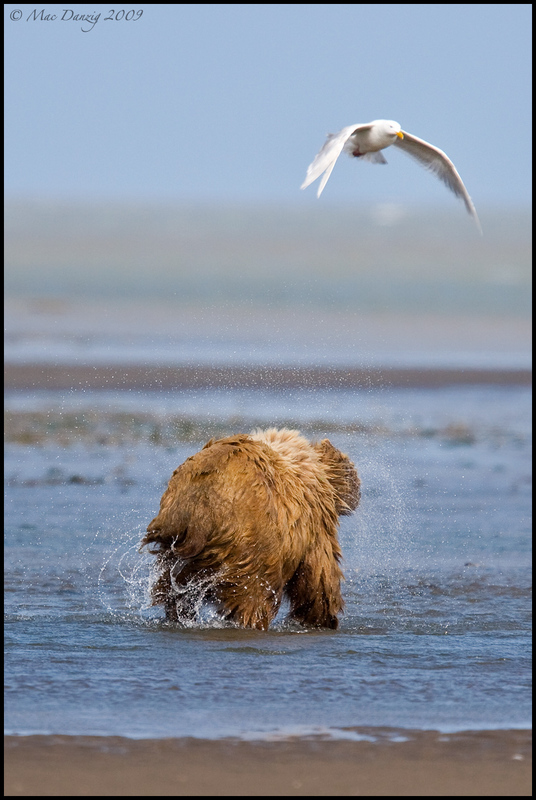 One of the other options when hunting for Bear photos in Alaska was to visit the Brook’s camp in Katmai, but the thoughts of standing on a cramped viewing platform next to hordes of other photographers to get shots of Bears Salmon fishing didn’t sound as appealing as what SSCL had to offer. I had heard the reports of standing within 20 feet of the Bears, watching them interact in their natural habitat with no outside humanly distractions. This seemed like the place for me. The owner of SSCL, David Coray was extremely helpful in assisting me with the booking and planning process. In the end I decided on flying into Kenai, AK via Anchorage and spending a night at one of David’s rental properties in the area. In the morning, his assistant drove me to the Soldotna Airport and I took a bush plane across the Kenai Peninsula, directly to Lake Clark National Park. There are only two ways to get to the area; by boat or by air and since there is no airport, only small craft like bush planes and float planes can land. This makes for a truly remote location that is still untouched by development. (Let’s hope it stays that way.) Bill Lockhart had told me about the flight and it definitely lived up to expectations… Truly unforgettable. 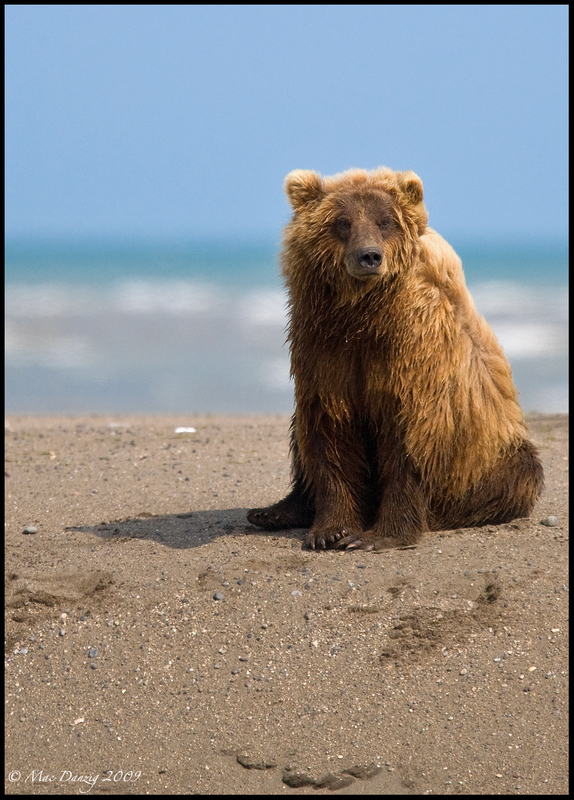 We landed directly on the beach, just a few hundred yards from the lodge property where I was greeted by Jenny, my assigned Bear Guide. The guides a SSCL are top-notch and have a true respect and understanding of the wildlife in the National Park. They also understand a great deal about photography and will always help position you in the best area for good lighting. 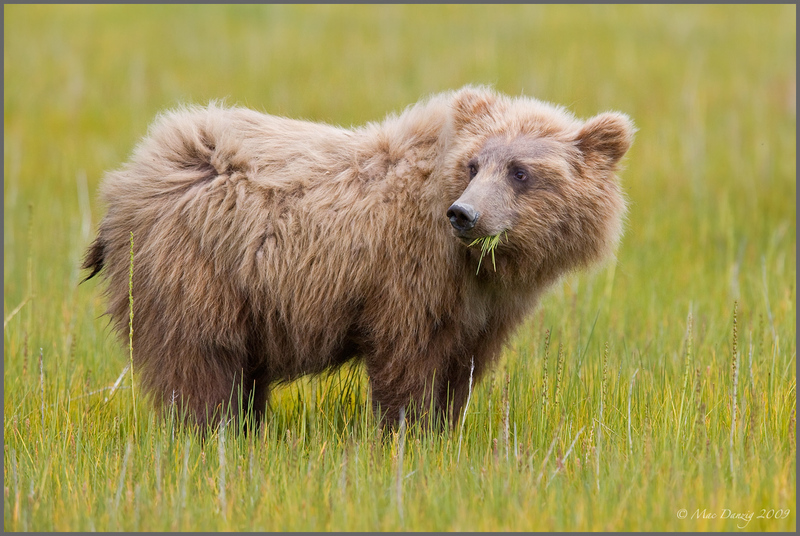 These guides often do not carry guns and one of the main reasons for this place being bear-friendly is because of the relationship the owners and guides of SSCL have with them. 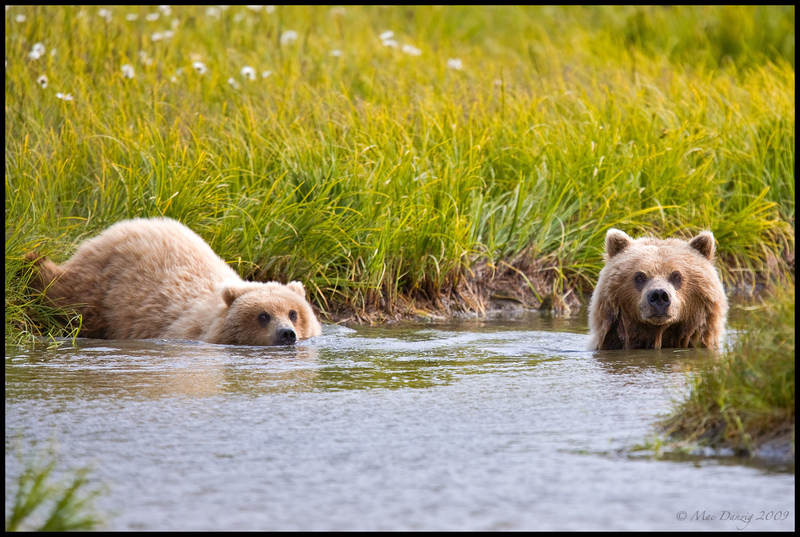 The bears are left alone for the most part and treated with the utmost respect in terms of territory and comfortable viewing distance. 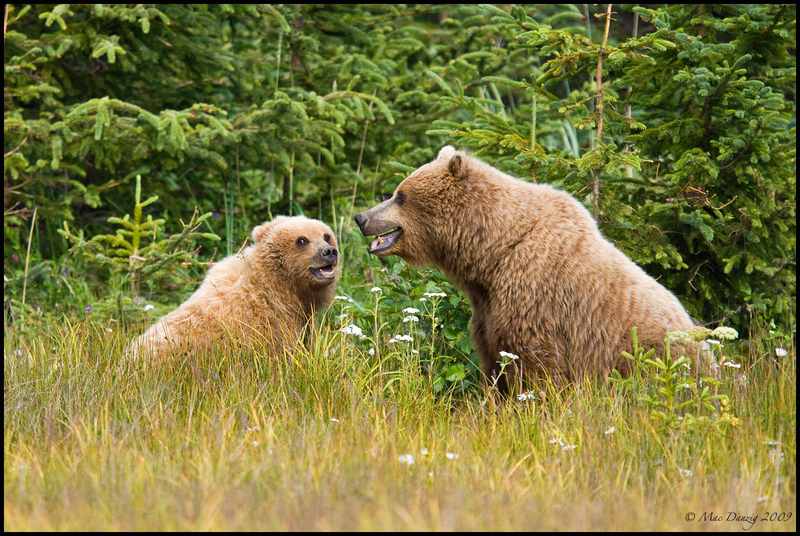 Trash and food scraps are not left out, so the bears are not enticed into scavenging on lodge property. Large numbers of non-educated people never find their way onto this part of Lake Clark National Park, because SSCL (and their neighbors – Alaska Homestead Lodge) keep the reservation numbers to a minimum and deter the “zoo” atmosphere by educating the few visitors they do have and only hire guides who keep the bear’s safety in mind just as strongly as their clients. 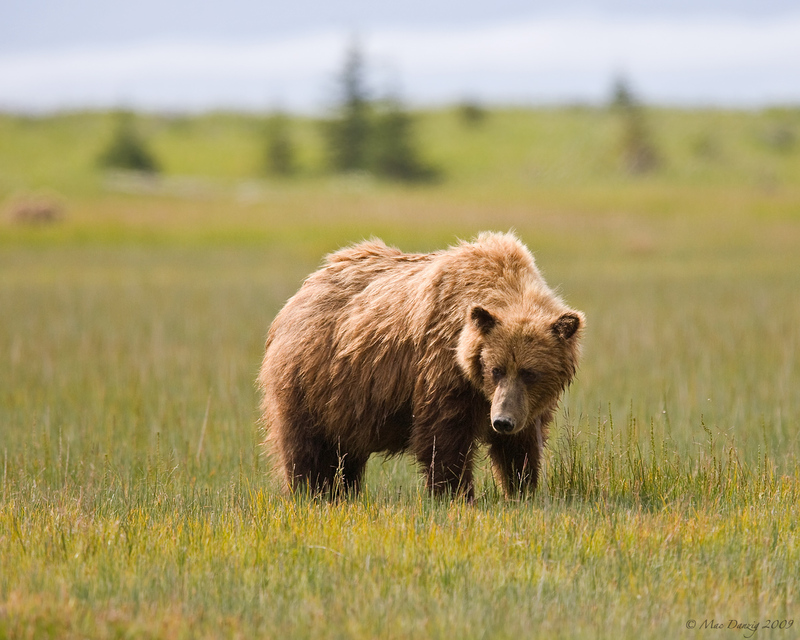 The land being on a National Park mean no hunting is allowed, and bears are only approached by the guides in wide open areas, such as grass fields they graze in, as well as shorelines and river outlets. I had to take a minute, stop looking through the viewfinder, and just absorb the scene… This place really is as magical as the people who went there before me had professed. Jenny went out of her way at every location to position us where the light was optimal for photography and guiding me to approach slowly to get those great close-up shots, at the same time always giving the wildlife their space. Throughout that first day, the light was (for the most part) excellent. We were able to catch shots three different Bear groups in three different areas before heading back to the lodge for dinner. (we skipped lunch that day and stayed in the field shooting.) I was fortunate enough to have Jenny all to myself during most of my stay and she was great company and extremely accommodating. We would see the other guests (a photo workshop group run by David Cardinal and guided by Drew – SSCL’s best guide) from time to time in the field, but there was so much room and so many photo opportunities for different bears throughout the area, that we never found ourselves crossing wires. 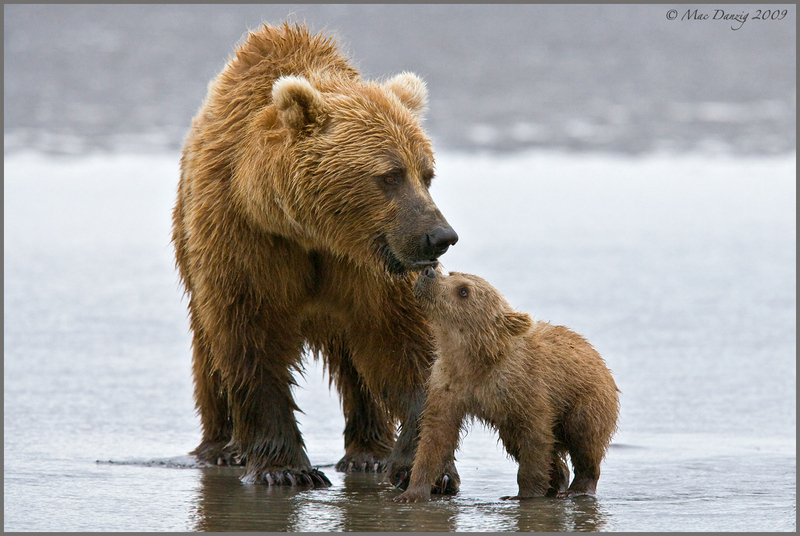 The bears in the Lake Clark National Park area are Coastal Brown Bears. 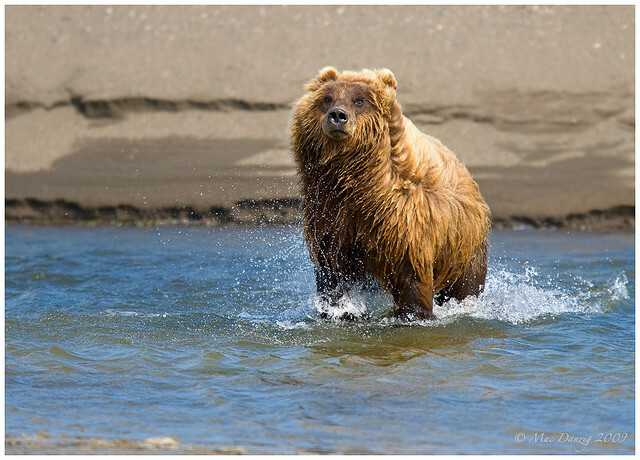 One of the reasons why they are larger than their Grizzly counterparts is because of their easy access to large quantities of salmon who come in from the ocean inlet to spawn in the freshwater in the peninsula’s rivers. Most of the early spring and summer however, they spend a great deal of their time grazing on sedge grass in the meadows just in from the coastline. On day two we lost the good light, but an amazing adventure that day definitely changed things for the better. As luck would have it, I happened to be the only solo visitor to the lodge at that particular time… The other 6 photographers there were part of a workshop being conducted by David Cardinal. 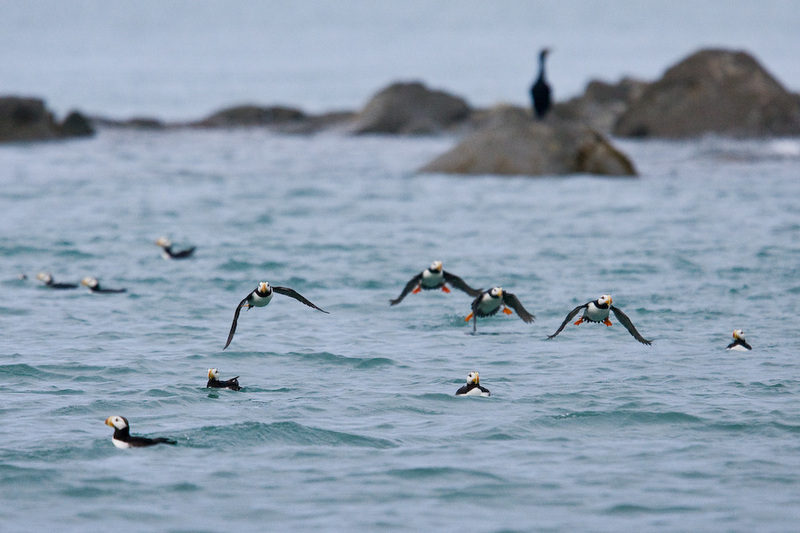 Part of their itinerary included a 90-minute boat ride to Chisik Island and Duck Island, located in the Tuxedni National Wildlife Refuge area. Since there was extra room and only one of me, I was graciously invited to come along on this journey, which ended up being unforgettable. As we left the coast on David’s boat, we crossed over a strongly-defined line of change in water color. This is from the volcanic ash deposits that flow freely from Mt. 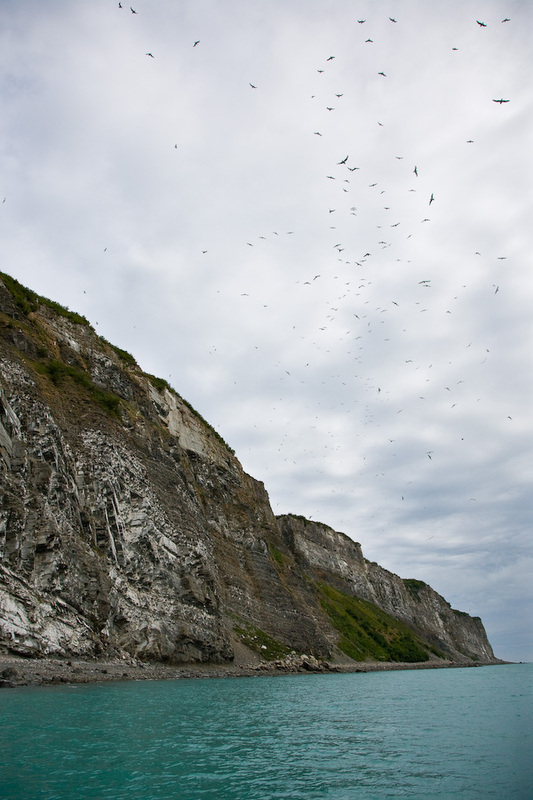 Redoubt and is cast out directly into the saltwater peninsula… After about 30 mins of rough, choppy waves that bounced us all over, the water calmed and we headed toward the cliffs of Chisik island, where thousands of Kittiwakes nest. As we floated closer, there was a cacophony of fleeing bird calls that became almost deafening. After a few moments, I realized that there was a large Bald Eagle soaring close by the nests and as soon as I put my telephoto lens on, he began to attack. 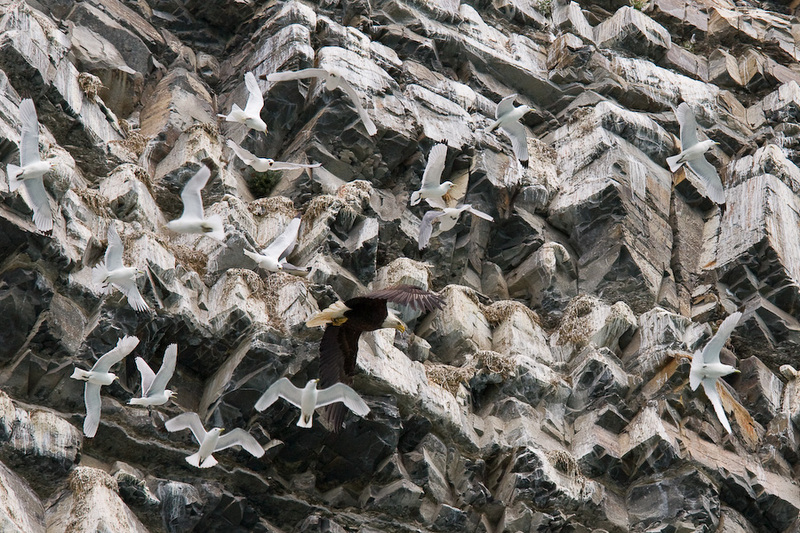 Some of the Kittiwakes attempted to attack the Eagle, while others flew for their lives in a scattered, unorganized panic. Unfortunately, 300mm was not a long enough reach to capture the action of this Eagle’s failed attempts at hunting on this afternoon, but luckily I was able to at least obtain some documentation to help me remember this amazing moment. 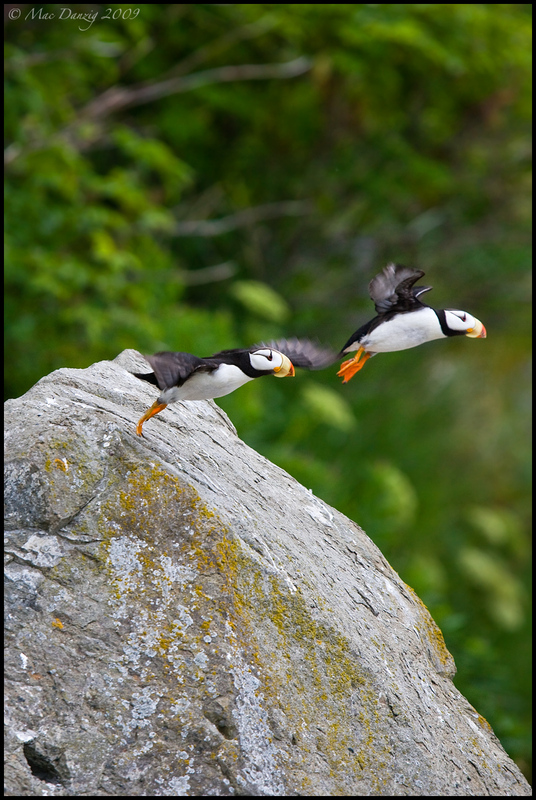 Traveling on to Duck Island, just north of Chisik, we dropped anchor and spent a few hours photographing Horned Puffins. These birds have been one of my favorite species since I was a young child, so getting the opportunity to photograph them was worth the trip to Alaska alone. 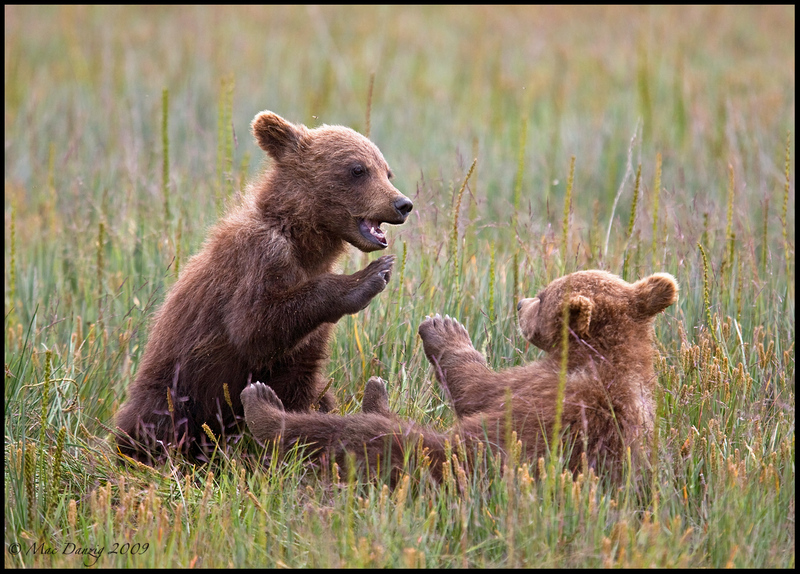 The third and fourth days were mostly a wash-out, but my guide Jenny and I still went out in the rain and did our best to photograph the Bears within a few square miles of the lodge. I also took the opportunity to spend some time socializing with the group taking David Cardinal’s workshop (who happened to be all wonderful and intelligent people) and eating the amazing food that they prepared for us… I was incredibly lucky to have Dorian (David Coray’s daughter) there in addition to the resident chefs. Dorian was incredibly knowledgeable about the Vegan diet and went out of her way to make me the most amazing vegan dishes and deserts. I am not kidding, it was like Thanksgiving Dinner for breakfast, lunch and dinner – every day. I have never eaten that much good food in my life. I am already thinking about summer 2011! “Reflection” – A Gallery opening in LA featuring my work. Hi everyone. – Some of my work will be on display for viewing and print sales for one week at the Coppola Art Exchange in Beverly Hills, CA. 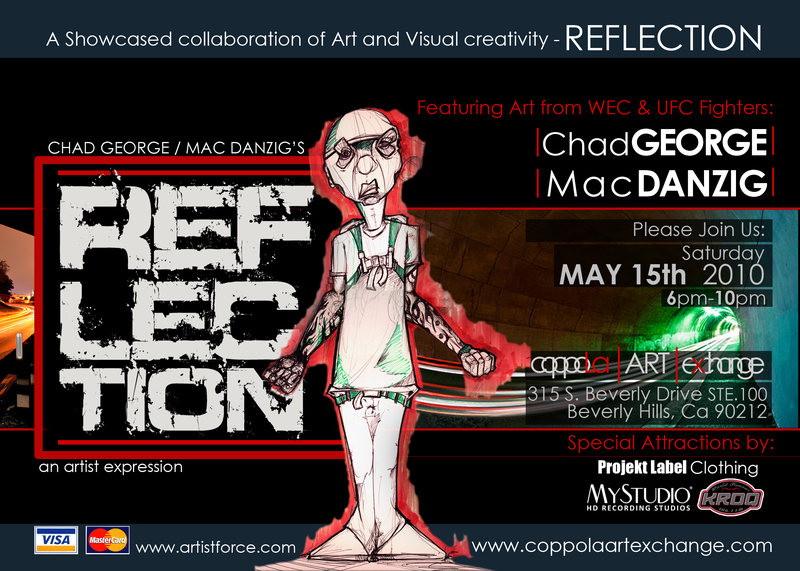 I am showing this gallery in conjunction with fellow MMA fighter, Chad George who is an art major from the Art Institute of California – Los Angeles, specializing in ink drawings and sculptures, which he will be showing along side my photography. The opening night is May 15th and will include festivities, a live DJ and free Wine. If you’re in the LA area on the 15th, please stop by and have a look. See you there! “Blue Canyon” is another one of the amazing and remote gems in the Southwest that has an incredible array of rock formations which are extremely delicate. The name is a bit of a misnomer, as there isn’t anything “blue” about it. 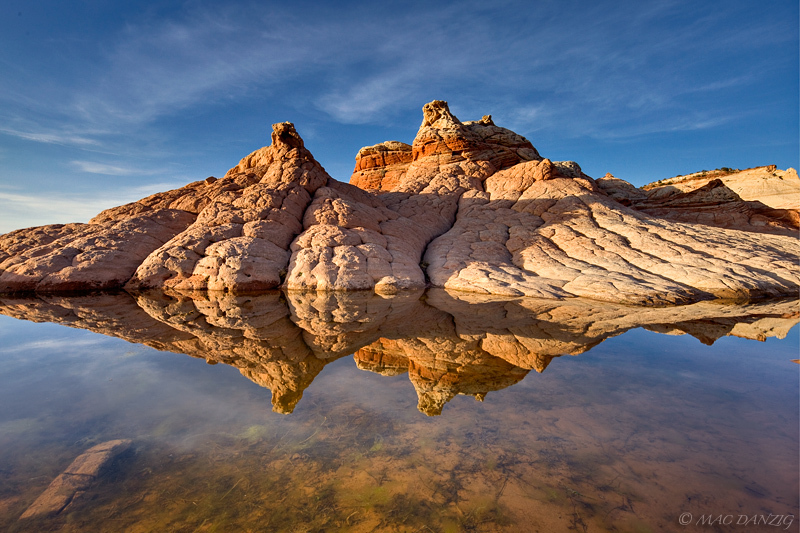 During the same photography trip that eventually included White Pockets, my good friend and I headed to this, another part of Arizona seldom seen. With some extremely helpful information from a great local photographer, we easily found this canyon after a few hours of driving through the highways and back roads of Arizona. – Just in time for sunset. Unfortunately, the sky was flat and boring, just as it was during much of that week in the Southwest. Fortunately for me, my friend is a night time long-exposure fanatic like I am, so we hung out for about 90 minutes after dusk and began composing some star trail shots… Like I often do with star trails, I located Polaris (the north star) and composed my foreground to work with it, thus creating a spiral-like effect over the long exposure. Normally, I like to shoot star trails under a new moon (that’s no moon at all) or at least during a time when something less than a half-moon has already set below the horizon. This helps me achieve a very long exposure time without the sky getting blown-out or overexposed… This time, I shot under a 25% moon which was really great because there was no need to light-paint with an artificial source. At the same time, I was restricted to a sub-30 minute exposure, but as I am learning- the need to expose for an extremely long time isn’t as important as the other elements involved in capturing a perfect star trail shot. The longer trails from 1 or 2-hour long shots aren’t even always that aesthetically pleasing, in my opinion. While we were there, I also took some moonscape shots with higher ISOs. I will be posting some of them soon. In the end, I was very happy with the way this shot turned out. The need for post-processing was very minimal as well. One thing I must touch on again is how incredibly delicate these structures are. This isn’t a place that will hold up to many human visits and because of that, I am not ever going to publish directions to this area. Unfortunately someone eventually will, and unless the local Navajo council (which governs the land that Blue Canyon is on) does something to regulate visits, we may see a similar situation as what happened in Fantasy Canyon in 2006. For now, the remoteness of the area and relatively unknown terrain will keep most people away. But if you do go there, please watch where you step and tread lightly. This will help ensure the physical preservation of this magical area for future visits. 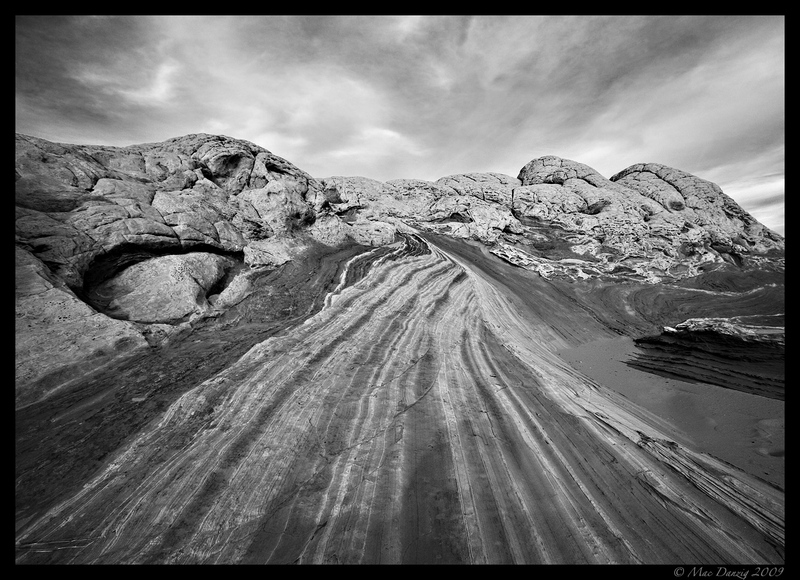 Photo Trip Report of ‘White Pocket’ located in the Paria Canyon – Vermilion Cliffs Wilderness area. Remote locations that few people venture to here in the Southwest seem to have a magnetic quality for me. Add to that a beautiful, bizarre and other-worldly landscape, and I’m planning the trip already. 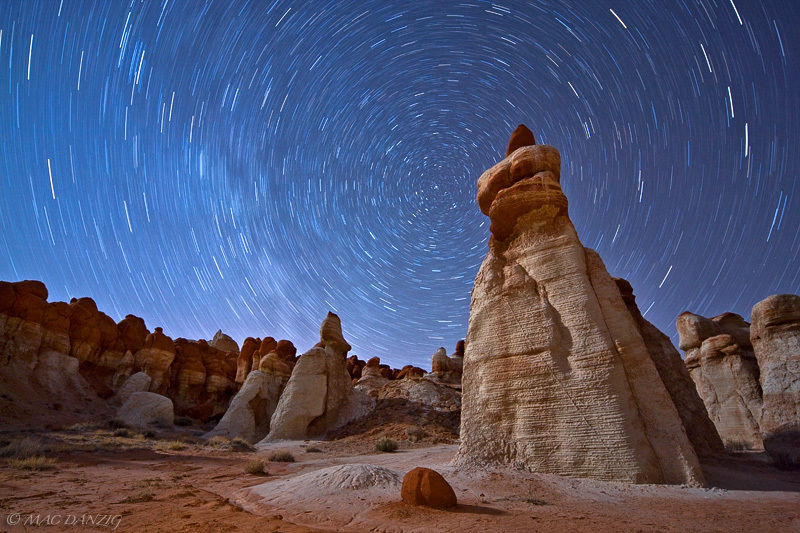 The area known simply as ‘the White Pocket’ in northern Arizona fits that bill perfectly. 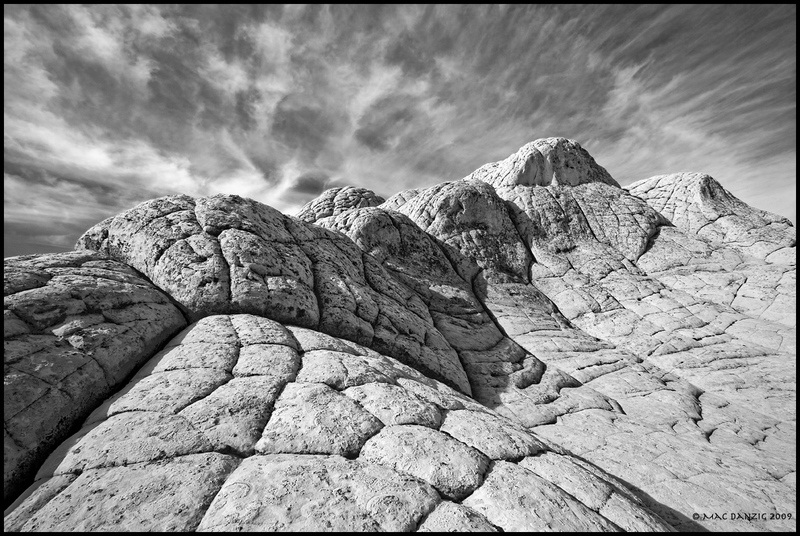 Just 6 miles east of Coyote Buttes South, (another gorgeous and remote location itself) White Pocket contains some of the most astonishing geology you will ever find anywhere on earth. 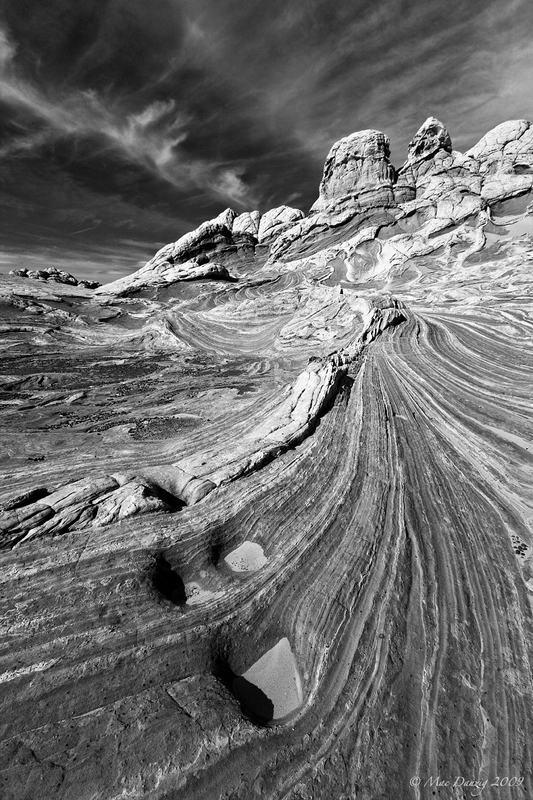 Like Coyote Buttes South, most of the formations are layered sandstone, made from different generations of sand dunes deposited hundreds of millions of years ago during the Jurassic period. Geologists say that every time a new layer of dunes was blown onto an existing layer, the ones beneath it were compressed and hardened by groundwater minerals. These crossbeds often have different colors because the mineral deposits in the groundwater (sometimes rich in iron) varied from generation to generation… The formations at the White Pocket are distinctly different from the ones you’ll see at Coyote Buttes because much of the top layer is as the name states: ‘white’. This is because the last generation of sand that solidified over the white pocket area was rich in silt. All of that gives a fair idea of the basis behind how these formations came to be, but the truth is, nobody really knows exactly how the formations here came to take on such a chaotic appearance. There are abundant signs of soft-sediment deformation, but in ways that aren’t normal. I am obviously not a geologist, but I’ve heard theories of earthquakes, floods and volcanic action during the sedimentation process… If any of that means anything to you, that’s great. If not, that’s ok too, because visual stimulation is something anyone should be able to enjoy, regardless of your interest in geology. Although I’d have to admit that this landscape may be too chaotic and random for some people’s taste. Supposedly the area was named by cowboys and ranchers who settled the land in the late 1800s and early 1900s. ‘Pockets’ generally referred to areas of hard rock in the desert where rainwater would collect. Cattle still roam somewhat freely in the Pariah Canyon wilderness and the white pocket is still used as a water source by many animals traveling the sands from Autumn to Spring. In the middle of the formations there is still the remnants of an old dam wall built by ranchers to help keep more water contained. 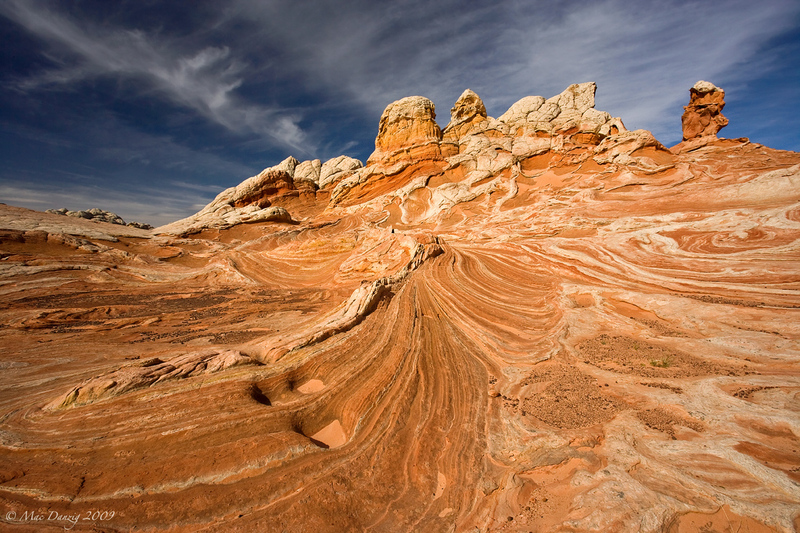 The formations here lack the perfect symmetry that has made “the Wave” in North Coyote Buttes so famous. And because of that, it is much harder to photograph. You can spend days here (trust me I know firsthand) and not even come close to capturing the pure cacophony of swirling rock the way your eye saw it. I would need a week here to even begin to do this place justice photographically, and as I write this I am realizing that words do very little to explain the feeling you get when standing in the midst of these ancient monsters. To me, there is something very special about desert areas with aesthetic appeal that also see very few human visitors. The silence is deafening. The environment unpredictable and inhospitable. That is what attracts me to places like this rather than the better-known parks. Take for example Zion National Park: It is one of the most beautiful places on earth, but unless you’re there during winter, you’ll be constantly rubbing elbows with fellow photographers, hikers, old ladies with disposable cameras (flashes on all the time), soccer moms, baseball dads, nature nuts, confused city folks, tourists of all kinds, bikers, and whining children who just want to go home and play Xbox (among others). Now don’t get me wrong, I like the company of other people as much as the next misanthrope, but you have to admit there’s something stripped away from the feeling of a wilderness area when it’s been turned into an outdoor mall… You’ll get none of that in White Pocket or Coyote Buttes South. There are no main roads that join landmarks together, no overlooks and no nearby lodging. This is why I seek these sorts of places out. And unfortunately that’s why they are becoming more and more popular every year. I shouldn’t complain since I am part of the problem: photographing the place and blogging about it. But in the tradition of being an American citizen, I’ll go ahead and complain anyway. Getting there isn’t easy. In fact, it can be completely impossible if you don’t have a vehicle with high clearance and a good 4wd or Awd system. The closest towns to this area are Page, Arizona to the east and Kanab, Utah to the west. Both of these “cities” could be considered “in the middle of nowhere” to many people as it is, but then there’s the venture from one of those towns (take Page for example) to the White Pocket itself which includes 35 miles on a 2 lane highway, followed by 20 miles on a rutted-out one lane dirt road and finishing up with a 15-mile plow through the driest, deepest sandy back roads you’ll probably ever encounter. I won’t publish directions, but as the old saying goes -‘seek and ye shall find’. There are plenty of detailed directions to the White Pocket if you’re willing to do a web search. Another thing that’s a plus about White Pocket is the fact that you don’t need a permit to legally go there, unlike Coyote Buttes North and South. This makes planning your trip a little bit easier. Those wishing to legally obtain a permit for Coyote Buttes (North especially) have to jump through a series of hoops which is honestly a good thing in my opinion, because it keeps the hordes of tourists away. With White Pocket, the last 10 miles of “road” are the hoops you have to jump through and that itself will discourage a lot of people. Still, on my last visit, there were two other parties camping there besides mine, and an average of 3 to 4 vehicles a day came through for day-hikes. The good thing is that most likely anyone you run into out there is going to be a decent person. Most people visiting are serious photographers or nature enthusiasts/adventurists. 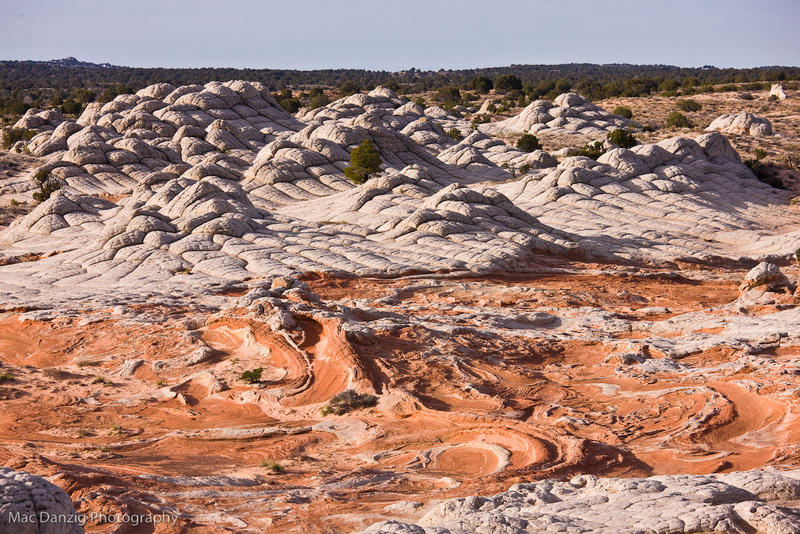 There is a feeling that the BLM may have to start issuing a permit system for the White Pocket in the future. Only time will tell. If you’re going to visit the White Pocket or Coyote Buttes South, you are going to be driving through some very deep sand. Don’t even bother trying to get there in a passenger car. 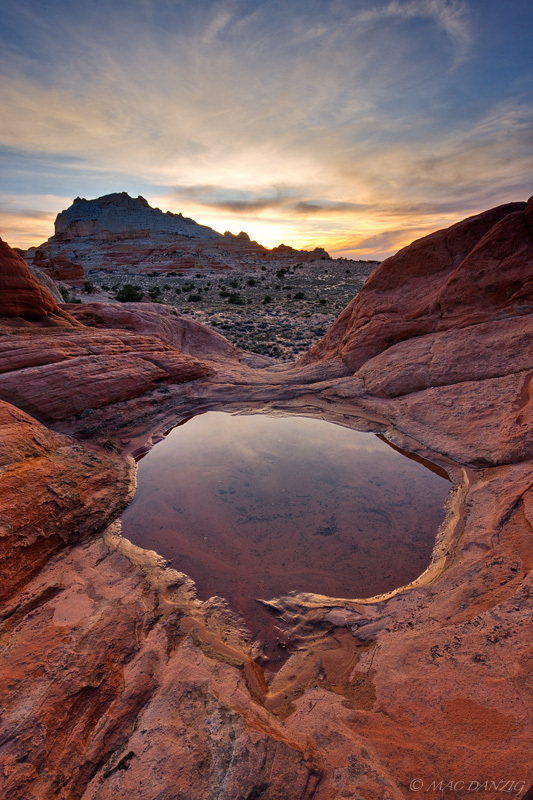 You can get to the Coyote Buttes North trailhead in a small car, but you won’t make it to White Pocket. I suggest bringing an air compressor and deflating your tires to around 18-20 psi. This will help your vehicle glide over the sand a little better. Use the air compressor to bring your tires back to normal psi when you return from the sandy roads. A shovel is a must in case you get stuck. The most difficult thing about these deep sand roads is that there are abrupt patches of extremely sharp, uneven rock here and there throughout the trip. In order to get through the deep sand you need to keep up your momentum because without traction, you will get stuck in the sand if your vehicle stops. – But in order to get through the rocky parts of the road without blowing a tire (like I did this last trip) or bottoming out and damaging something crucial underneath, you have to slow to a crawl… This means you have to keep your eyes open at all times and be ready to quickly slow down when the sand turns to a stairway of sharp rock. This can be very nerve-racking (or very fun, depending on how you look at it.) 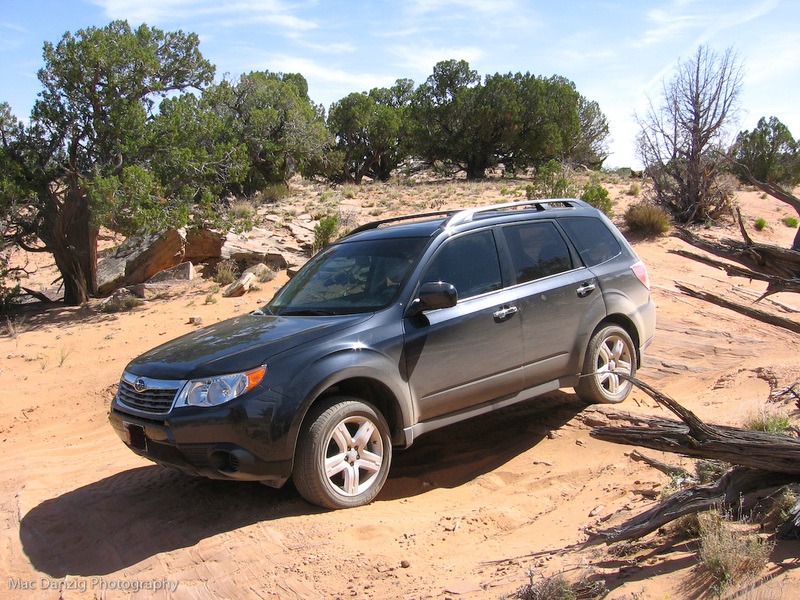 I drive an 09 Subaru Forester which is an underrated and very capable off-road machine. 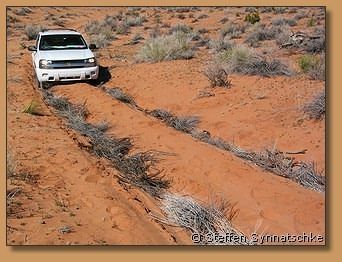 It has gotten me there and back twice now, but I have seen more than a couple pictures of American 4×4 trucks stuck in the deep Paria Sand. Another thing to consider is bringing some extra floor mats or strips of old carpet in case you do get stuck… These can be tied to your rear forks so that you can keep going through the deep sand once you get going again, without having to stop to pick them up and risk getting stuck again. The hardest part of the drive is coming back from the White Pocket, about 2 miles from it- A steep winding hill that you will go down in order to get there. The main difficulty is that at the bottom of this hill, there’s an old dry creek rut that makes gaining momentum for the hill impossible. But chances are that if you got there, you will make it back- no problem. Obviously, there’s no cell phone service out there, so keep that in mind when planning. As stated before, photographing this place is not easy. There are so many twists, turns, peaks, valleys, and utterly strange shapes here that it’s hard to make a traditional landscape or abstract composition work. This forces you to think outside the box photographically. Like most landscapes, early morning and evening offer the best light. If you go between October and March, you may be lucky enough to have pools of water to photograph as well. On my most recent visit, I spent my time in the hard mid-day light exploring the surrounding area. This was an excellent exercise which only left me yearning for more exploration. 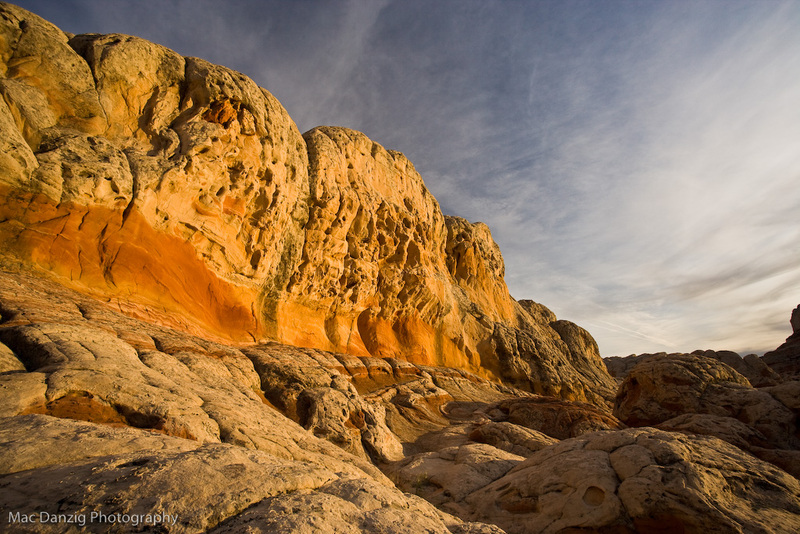 I was able to hike up to the highest point in the general area – just east of the White Pocket, and take This Panorama of the landscape from atop a huge sandstone cliff. Although not a technically great shot, it’s unique and pretty interesting as it shows a seldom-seen view of this location, looking down onto the White Pocket from above. 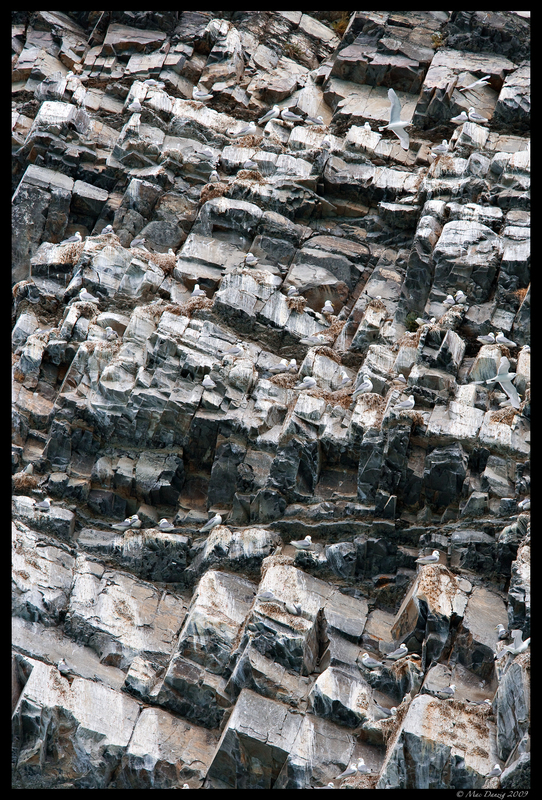 I have made some ‘snapshots’ that work with the interface of the Gigapan site so that you can get a better idea of how the landscape is spread out. When you look at the broad landscape from any high vantage point in the White Pocket, you will see Coyote Buttes North, Buckskin Gulch, and countless unnamed and largely unphotographed rock formations tossed throughout the Paria Plateau. This scene makes me want to spend a few weeks backpacking in the area, simply exploring – photography being secondary. One thing to remember is how extremely delicate the terrain here is. Please be careful where you tread. A misplaced foot can crumble a formation that took millions of years to form. The original Synnatschke blog post from ’05 that still contains some of the best info on this place. Photographing Arizona blog entry on White Pocket and Coyote Buttes South. 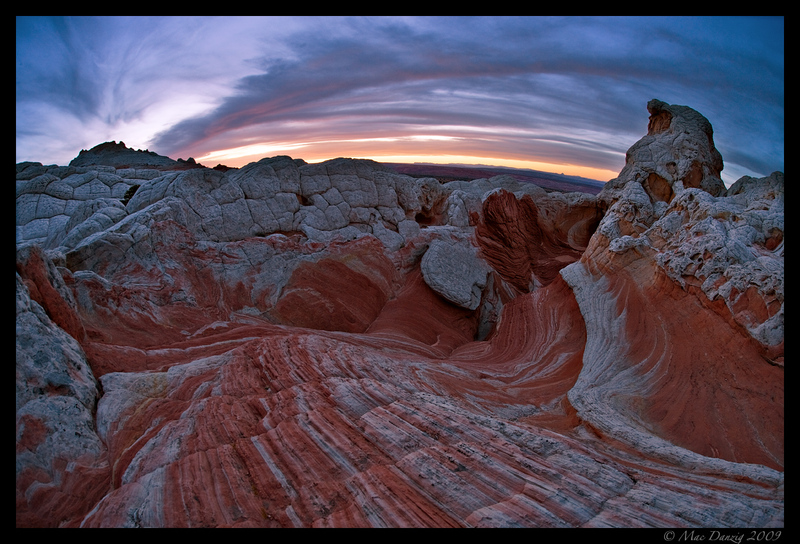 A Panorama I took from high on a eastern cliff of the White Pockets and surrounding area. Post Processing: 3 images blended using “Exposure Fusion” in Photomatix Pro. 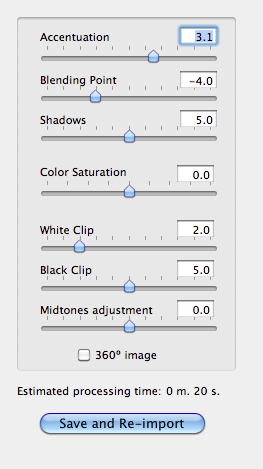 Adobe CS4 for finishing adjustments. This is one of those photos that really reminds me of the place and time in which it was taken – and evokes the same feeling as when I took it…. Canyonlands National Park in Utah is one of my favorite places on earth. It sees far less visitors every year than it’s sister, Arches National Park and for my money is probably the second most amazing large area (geologically speaking) in the southwest. 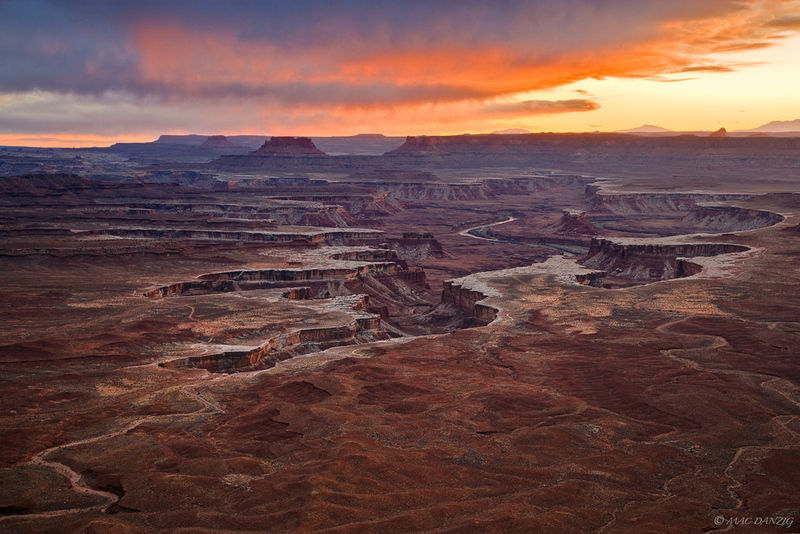 The evening I shot this, I was originally planning on going to Dead Horse Point for sunset, but some Japanese large-format photographers I met up with at False Kiva that day convinced me to go to the Green River overlook instead. I’m glad they did. There was a storm off in the distance looking westward and just after the sun set, an afterglow lit up the rain clouds. Standing at the edge of the cliff in the ‘Island in the Sky’ district that overlooks the Green River and White Rim road, you are 1500 feet above the foreground you see in the photo. This kind of height almost lends itself to an ‘aerial’ sort of feel. It took me a long time to finally get to this one in my back catalog and I’m not sure why, but I’m fairly certain it has something to do with the fact that I am a procrastinator when it comes to processing bracketed exposures… For the processing, I used Photomatix’s ‘exposure fusion’ algorithm, rather than ‘merge to HDR’… Darwin Wiggett first told me about exposure fusion not too long ago and I love the results when compared to making HDRs, which depending on the scene, can often look garish and unnatural no matter how much time you put into them. Here is what my settings looked like for the three bracketed exposures that I blended. I then sent it to CS4 and did some levels adjustments, as well as a subtle Selective Color layer and sharpening.